This is a completely customized football theme Green Bay Packers and Chicago Bears wedding cake topper ordered by one of our customers. They would like the bride to be wearing a navy blue Chicago Bears football jersey, blue jeans and black flips flops that show the Violet tattoo on her foot. The arm farthest from the groom is holding a bouquet of fresh cut flowers yellow roses & deep red daisies and the other hand is holding the grooms. For the groom, they would like him to be having on a green Green Bay Packers football jersey, blue jeans and his Timberland boots. The arm furthest from the bride is holding a football. On top of the groom’s head is his Cheese Head hat! They would like the front of the jerseys to read their wedding date October 20, 2012, groom to wear 10, bride to wear 20 and the back of their jersey to read the wedding year; the groom to wear 12 and bride to wear 20 (2012). Name on back of both jerseys reads DICKMANN. 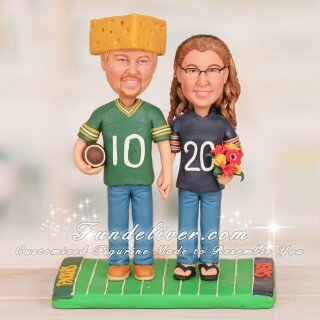 For the base, they would like their figurine to be standing on a football field with PACKERS written on the side nearest to the groom and BEARS written on the side nearest to the bride. Same football fans? 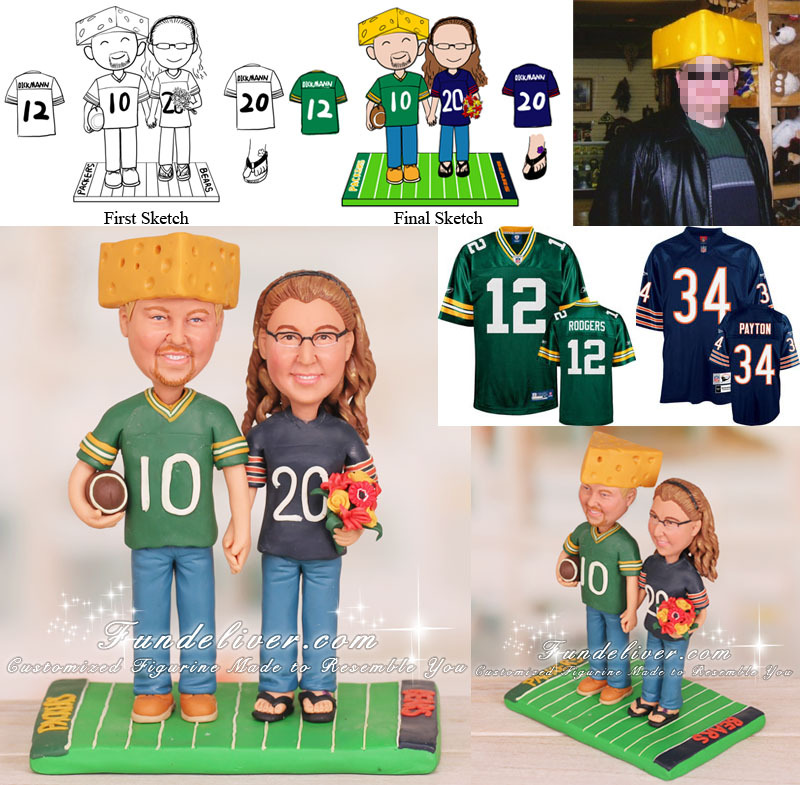 Love this Green Bay Packers and Chicago Bears cake topper? Why not incorporate your favorite football teams into your wedding cake toppers? Just send us your ideas and reference images, we will first design some 2D sketches to get your approval and then turn them into 3D figurines.